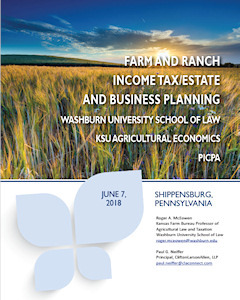 The Washburn Agricultural Law and Tax Report (WALTR) focuses on legal and tax issues that agricultural producers, agricultural businesses, and rural landowners face. Some issues are encountered on a daily basis; others may arise on a more cyclical basis. Many issues illustrate how the legal and tax systems in the United States uniquely treat agriculture and the singular relationship between the farm family and the farm firm. In addition, there are basic legal principles that have wide application throughout the entire economy, and those principles will be evident in the annotations, articles, and media resources on this website. For students and those involved in agriculture either as producers of commodities, consumers, or in the agricultural industry, WALTR will help you gain an ability to identify agricultural legal problems and become acquainted with the basic legal framework surrounding agricultural issues and the tax concepts peculiar to agriculture. It will become evident that agricultural law and taxation is a very dynamic field that has wide application to everyday situations. WALTR is also designed to be a research tool for practitioners with agricultural-related clients. Many technical issues are addressed and practitioners can also find seminars to attend where the concepts discussed here are more fully explored. In addition, media resources address agricultural law and taxation in action as it applies to current events impacting the sector. This February 8, 2019 program is available to view on vimeo.com for $50. Credit is not available for viewing the program through Vimeo. Attend either in-person or via web simulcast. 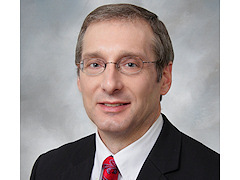 Roger A. McEowen authors the Washburn Agricultural Law and Tax Report. Roger McEowen regularly appears on radio and television programs heard nationally and across the Midwest and on the worldwide web. Discusses potential glyphosate-related legal Issues and advises agricultural producers about steps they might want to take to protect themselves from any potential legal liabilities from the use of glyphosate herbicide. 4/8/2019 RFD-TV - Watch (3:16). Discusses the implications of the Roundup litigation on a farming or ranching operation. 4/8/2019 Ag-Issues - Listen (15:13). Discusses recent jury decisions in California regarding glyphosate (Roundup) herbicide, livestock handling during vaccination of calves and headbutting ram case on a neighbor's farm. Discusses court cases, family farm trust disputes among the heirs, insurance policy and power outage caused by squirrel, and state agency's latitude in enforcing groundwater use regulations. 3/25/2019 RFD-TV - Watch (3:35). Discusses the Packers and Stockyards Act in Kansas.